Looking for some temporary peace and quiet from alerts and notifications but don’t want to completely disable Notification Center on your Mac? There are two quick ways to temporarily hush all notifications in Mac OS X, silencing and stopping both the pop-up alerts and sound effects with the notifications, these two methods last until the next day before automatically resuming. For most cases, the easiest way to turn off Notification Center is by using the Mac menu bar icon for the service. 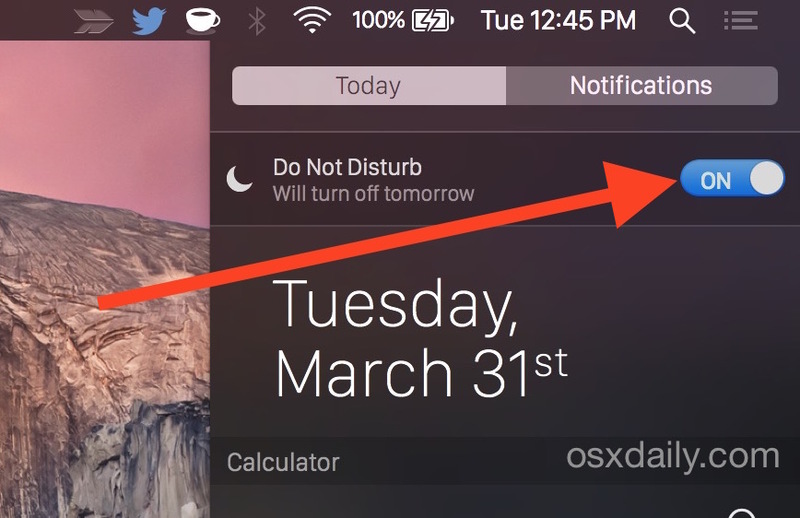 We’ll show you two different ways to temporarily disable Notification Center on Mac by using Do Not Disturb mode. This turns off all notifications in Mac OS X for 24 hours. You can think of Option+Clicking the Notification icon on a Mac is like hitting the Do Not Disturb moon button in iOS. To re-enable Notifications again, just option+click the menu bar icon again. It will turn black to signify that it’s active again. If you’re less of a keyboard fan and more of a gestures person, you can also hush notifications directly from the panel itself, the verbiage of this is different depending on the version of Mac OS X in use. Note that for Macs running Mac OS X Mavericks or newer, this has been renamed to “Do Not Disturb”, but the functionality remains the same as on older versions toggling the ‘show alerts’ button. Flipping the switch back to ON, or option+clicking the icon works to re-enable alerts again. If you want to continue to be alerted by are annoyed with the sounds, remember that you can mute notifications on a per-app basis too. Thanks to everyone who sent in these tips. ok, but how do i turn it off compleatly? 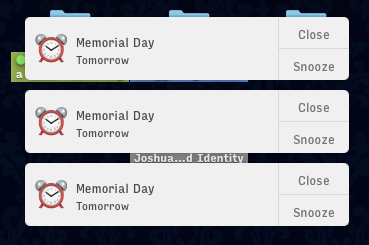 There is no way to turn this off for now without disabling Notification Center entirely or Calendar entirely.